Before any of that hit the table, though, there was one more treat coming: a molasses spoonbread, still in the hot pan, with a generous dollop of some melting butter sweetened with honey. 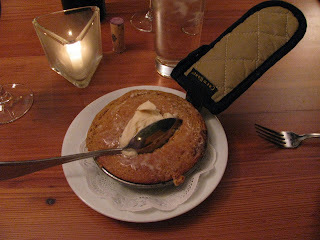 This was another unexpected and delectable treat (which, I should note, rendered the bread basket we ordered somewhat superfluous, but who knew?). 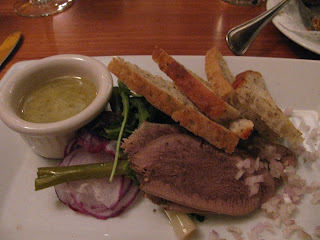 As a starter, we had a braised beef tongue, slices of which were served along with some pickled green onions, a sprinkle of shallots, some thin-sliced radishes and a spray of greens, along with a mustardy vinaigrette. 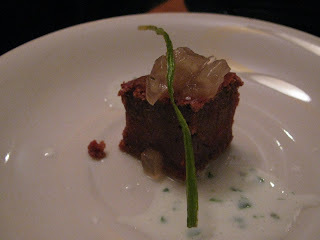 This was actually the only disappointment of the evening: the tongue was tender but bland, perked up only by the presence of the pickled onion or the vinaigrette. Maybe more of an herbal presence in the braising liquid would have livened this up some. 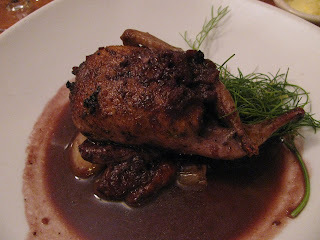 Nothing else we had could be accused of being underflavored - certainly not this quail, which was nicely roasted, stuffed with some well-spiced boudin blanc, and served over some figs and ripe persimmons in a rich red wine jus. 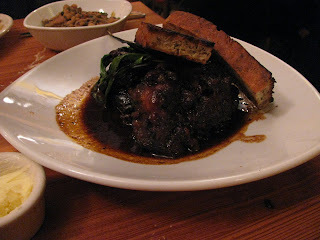 The oxtails, in a sauce that was reduced down nearly to a sticky glaze, were even more decadent. The meat was velvety tender, its rich flavor echoed by the dense braising liquid, which was enhanced and enlivened with a bit of chile. I have convinced myself somehow that it is perfectly socially acceptable to eat quail with your hands, as it's all but necessary to get all the meat off those little bones. I nearly picked up the oxtail bones to gnaw on too, though I can't even begin to make a plausible argument that this would have been good manners. It wasn't easy choosing among the vegetables, but we limited ourselves to two. The turnips were cubed and dry roasted so as to get nice and crispy on the outside, while still tender and fluffy on the interior. 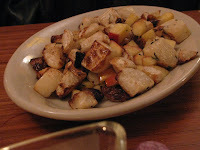 Interspersed with the turnips were cubes of apple, all of it enhanced with some bacon drippings. I actually pined for a little more emphasis on this final note, as some more salt and smoke would have complemented the sweetness of the turnips and apples. 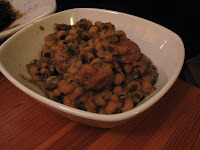 Though listed on the menu as "black kale with black eyed peas and sausage," it was the black eyed peas that were the lead player in our other vegetable dish, nicely creamy without being mushy, given a bit of an earthy, minerally tang from the kale, and all perked up with some assertively spiced sausage. Though both of these vegetable dishes were graced with pork products (something I often do with my own vegetables), there were several others that were devoid of porcine enhancement, and the menu also features a vegetarian "daily preparation of local farm vegetables," served with a crispy caramelized onion croquette, that our server enthusiastically recommended. 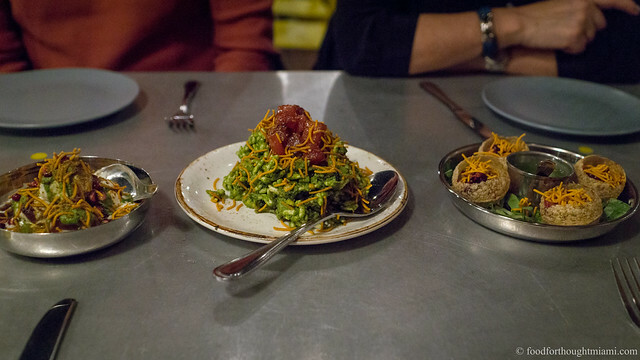 New Orleans does not exactly strike me as a vegetarian's paradise, but it is clear that Chef Loubier loves his vegetables. 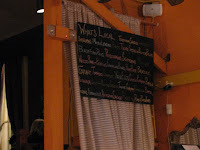 One of the other charms of Dante's Kitchen is that it's very fairly priced, with most apps at $10 or under, small dishes creeping up to around $15, and entrees in a $20-25 range. It's a real pleasure to find ingredients of this quality and cooking at this level, at those kind of price points. The wines, too, were eminently reasonable: an Achaval Ferrer Quimera (a big, bright Malbec-based blend) for only $55 seemed almost too good to be true. 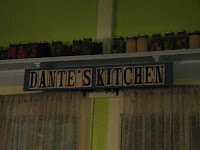 The style of the cooking at Dante's Kitchen is Creole but not overwhelmingly or stiflingly so. This is food that is about the ingredients, not about the genre. I noted in an earlier comment to a post that on this trip to New Orleans, which was our first in several years, we deliberately set out to try what's new, rather than return to the old guard places. While I love that you can have a meal at Galatoire's, or Arnaud's, or Antoine's that is not much different than what you would have had fifty years ago, and I hope by all means that you can still do so fifty years from now, we were interested this time around in seeing something different. 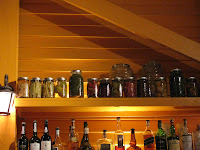 I was excited by what I saw at Dante's Kitchen - this is food that is not stuck in any rigid culinary tradition, but clearly has a sense of place. LOL about your quail logic- Any self respecting eater will pick up the bones once the knife and fork have done their best... even pulled this on the quail at Picasso; felt like a fugitive. Why treat the oxtails differently? Messy braising liquids? Same rule should apply although not sure it does!